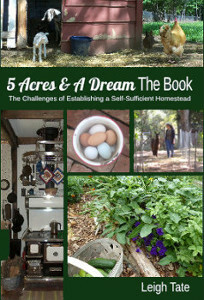 5 Acres & A Dream: And The Winner Is . . . . . . . . I numbered all your comments as they came in, giving the earned number of entries their appropriate number count. 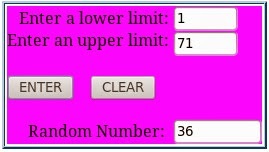 Then I used the custom random number generator at over at math goodies to select the winning number. Ashley, you provided your email so I'll be in touch to get a mailing address, and get your copy on it's way to you. For those who didn't win, I'm happy to offer a discount as a way of thanking you for helping me promote my book. For the next 48 hours, you can purchase a copy from my CreateSpace eStore for just $7.95 plus shipping and handling. That's $5.00 off list price! Click here, and enter code C5Z58YMW (expired) at checkout. The code is good for today and tomorrow only. For those outside of the United States the discount is available, although I realize shipping may be exorbitant. An alternate option might be BookDepository.com, which offers free shipping to many nations worldwide. To see a list of those, click here. Local taxes and fees still apply. Once again, thank you to everyone who entered! Thank you for all your kind words. I hope I may always be an encouragement to you in your homesteading endeavors. Congratulations, Ashley A.! 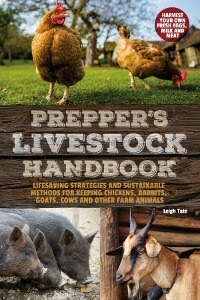 You will love Leigh's book and treasure it as an super-valuable book in your library. Congrats Ashley! Thanks for hosting Leigh! I'll have to see how money shakes out and see if I can grab it tomorrow! Congratulations to Ashley! And thank you, Leigh, for the discount code. Ordered mine with saved birthday money and am really looking forward to reading it! Ya'll are very welcome for the discount. It's the least I could do to thank everyone for their help. Now, if anyone (who hasn't yet) would be willing to write a review, I'd be ever most grateful! Thank you everyone for the congrats and thank you Leigh for being a modern day pioneer! I'm so excited to read the book! I will definitely write a review. Congrats to the winner. I'll look around for the best mailing option. I plan to get two. One for me and one to review on our garden club blog. Then I'll offer it either as door prize at garden club or on the gc blog. As for the goats reproductive cycle, I think we must always do what is best and most comfortable for our animals.